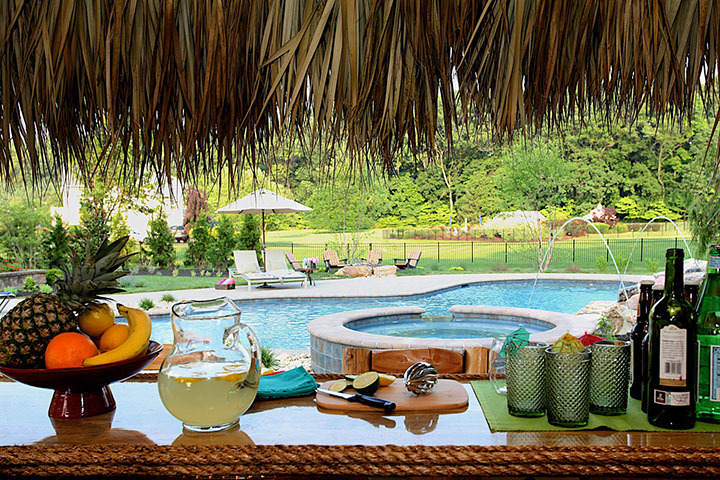 This Doylestown, PA pool has a unique Tiki Bar. In addition it has all the water features an in ground pool can have, a huge paver patio pool deck, a fire feature, and to top it all off a low voltage lighting system that really brings the party to life at night. Lets not forget the pool house, and matching paver stone driveway entrance. This outdoor living space has it all and then some. A very impressive space. The water features include a raised heated spa, a large sun-shelf, a cozy corner, a boulder waterfall, water jet streams, and colored led night lights. The fire feature includes a natural boulder fire pit which is both elemental and essential to make this space a well rounded outdoor experience. 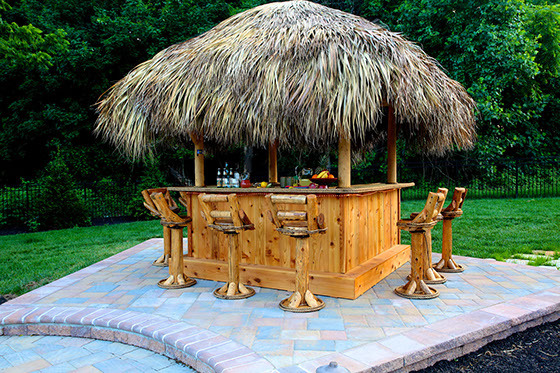 A unique feature is the Tiki bar hut which just makes such a cool element for entertaining guests during parties. 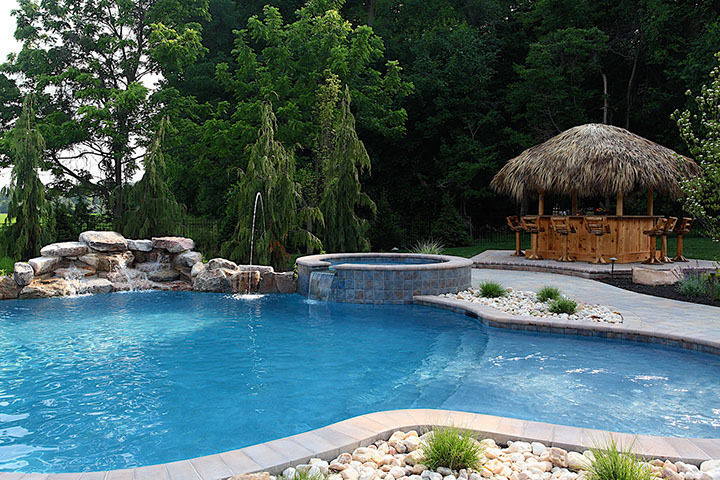 Lastly, a convenient pool house makes this place stand out as an awesome pool project. This new Freeform Gunite Pool features EP-Henry 6” Bullnose coping and EP-Henry Bristol-1 Pavers pooldeck. The pool also has a sunshelf and an in pool seat. Built into the freeform designs nooks and crannies are small pockets of river stone and planted grasses which add to the beautiful feel of this pool. Next to the pool is the new pool house. The pool house has a changing room. There is landscaping trees and bushes with mulch in front of the structure. A path of stepping stones leads to the front door. Along the edge of the structure river jack stone was placed and a stone veneer was added. Two water jets shoot water into the pool. Swim under them and let the water splash your head or just enjoy the sounds of flowing water. 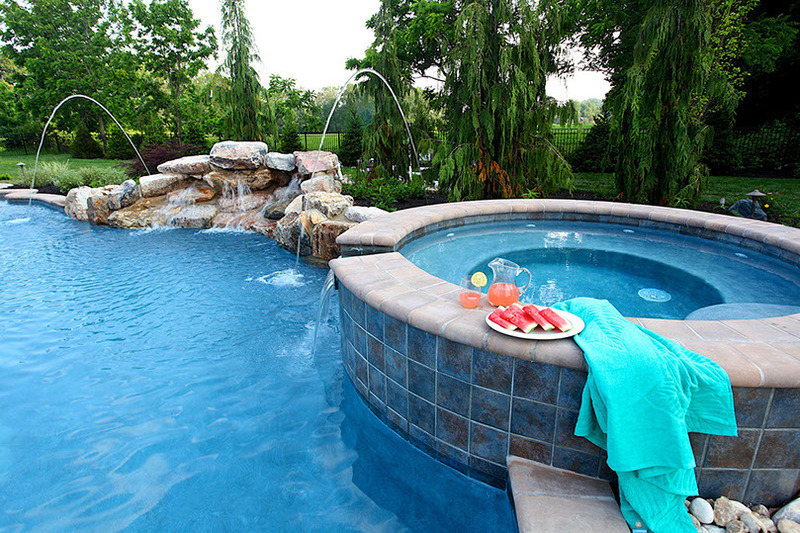 Built into the side coping of the pool is a custom boulder waterfall. Turn the water jets on, relax and let the stress melt away. Tiered up a bit is a 18" raised spa which spills into the pool.